When it comes to crossovers, Capcom are veterans having teamed up with the likes of Marvel and SNK. Now two of the top fighting games have decided to team up together and mix both their casts into one. Street Fighter X Tekken has very fluid and fast-paced gameplay and still has the same 2.5D plane fighting style that they use in the Street Fighter IV series. This time however you are able to tag in your partner during a combo using the tag system. The tag system in this game allows you to switch between your characters, even during combos. There are three ways to tag in your partner. The first is a Cross Rush, a simple light, medium, heavy, heavy combo. 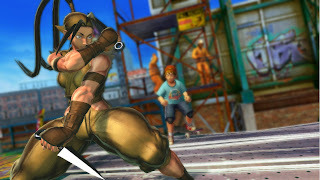 The second is a tag cancel where you are able to do a combo which launches the opponent into the air and gives you sufficient time to bring in your partner to continue the combo, this however requires 1 bar of meter. The third is a hard tag (tagging in opponent by pressing the two medium buttons together) where you call in your partner in on the spot however this leaves you vulnerable. The second is something that requires practice to pull off as you need to have two characters you know well, and complement each other so you are able to do a series of juggles, even finish it off in style with a Super art move. We're not friends anymore Kazuya! The Arcade mode is pretty similar to that of the SFIV series given that when you select your team a cinematic story begins to play, and by going through a series of teams you finally face the boss. When you’ve chosen a Street Fighter character as your first character you will end up facing Ogre at the end and if you decide to choose a Tekken character you face Akuma. Despite the story being weak this is a satisfying mode. Arcade mode request just like in Street Fighter IV has also been implemented in this game where you will get challenged by another player. It’s a great way to practice against the CPU until an opponent has been found for you. The Training and Trial mode allows you to practice and learn the characters moves so you are able to decide who suits you. The trial mode is definitely a great feature as it allows players to master characters and practice the hard and flashy combos. However the inputs it tells you to do sometimes lacked detail. For example Heihachi has a trial where you have to charge up a move but it didn’t even specify whether this move was even chargeable. 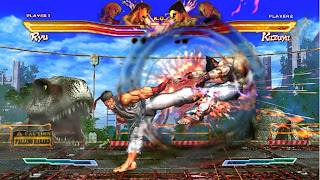 The Tekken cast retain most of their signature moves like Kazuya’s target combos. This has been implemented well with the Street Fighter IV style of play and makes the Tekken characters feel at home. Pandora mode is a feature that allows the player to sacrifice one of their characters that has less than 25% health to temporarily increase the strength of the other character and provide infinite meter so you are able to inflict some serious damage. You can turn a match completely around if used successfully,however if the opponent is skilled they will try evade and keep away till the Pandora mode is gone. These are just my butter knives. The biggest feature of this title is the Gem system which is apparently supposed to make a change in the way mirror matches are played. In Street Fighter X Tekken these are divided into two types, Boost Gems and Assist Gems which provide the fighters with boosts to their attack and defence. These gems activate once you fulfil the conditions it entails. Some gems however like the Assist Gems activate automatically but consumes some of the Cross Gauge meter. The inclusion of the gem feature looks to make Street Fighter X Tekken one of the deepest fighting games ever; however it does come with its flaws in terms of keeping the game balanced since some characters that are already ridiculously powerful become an even bigger threat with the use of them. Scramble mode allows all four players to be on the screen at the same time. This however can be a chaotic battle with a bunch of projectiles flying around. I personally don’t like this feature but it can be fun if you are playing with 3 others. To do well in these kinds of battles you’ve got to pretty much throw away your technical skills and play like the standard button masher you once were. The game gives you the ability to customise characters colours and costumes. While it’s a step in the right direction and makes players feel like the character is their own, the colour customization really isn’t broad enough as of yet as a result most players you will face may have utilized the same colours. In terms of costumes, these have been confirmed to be sold later as DLC. In online mode there are three modes you can choose from: online battle, replay channel and the leaderboards. Online battle offers players the chance to do a scramble match, an endless battle or ranked match. Before choosing any of the options you are able to search for a partner if you prefer playing as a team and enter these modes together. When you find a player you obviously feel like you want to see how you two will work together, luckily you are able to by entering the briefing room. It’s similar to the training mode except the other player is also there. Here you are able to brush up your team chemistry and figure out exactly when to come in during a combo. Ranked match's lets you test out your abilities against other players all over the world and fight for Player Points (PP). Setting up your gems before entering the online community is recommended highly as it will increase your chances of victory. In Endless battle you can battle other players casually and it lets up to 6 players all at once in a lobby. If there are more than two in the lobby you are able to pair with someone else. The online gameplay doesn’t appeal to me too much as the sound sometimes seems to cut off for one and number two; it just isn’t as fun as when you are playing local 2 on 2 with friends. When it comes to looking for matches, the loading times can be a big nuisance but the speed does vary from time to time. The match making itself feels like a huge step back from what was improved on in the Street Fighter IV series as you aren’t given as much flexibility as before. The visuals are completely revamped whilst still having that Street Fighter IV feel to it, giving the models a very stylized and bright look. As a result of this revamp the Tekken characters now fit in with the Street Fighter characters world. The flashy moves you can normally perform with Kazuya in Tekken where lightning appears to come out has been implemented here along with the red/blood like effect you see in Tekken when you get a hit confirmation. The environments you compete in have been given a lot of thought and are full of life. In various stages you will see many actions happening in the back ground and even characters from the Street Fighter and Tekken universes performing different actions for e.g. Ibuki’s friend and Kunimistu can be seen conversing on top of the Mishima Estate. Some environments also have multiple levels giving each round a different perspective. Street Fighter X Tekken is all about the fast paced, tag team battle. Tagging in and out between players is essential and will increase your chances of claiming victory. The Gem system is a fine addition that is both unique and offers new ways to change the outcome of a battle. Overall Street Fighter X Tekken is a great addition to the fighting genre and despite the issues with the online; it’s a revolutionary step forward. Note: This review was written before the patch update.